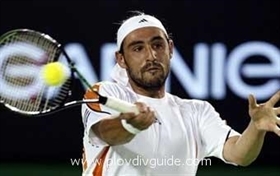 The finalist of the Australia Open tennis tournament, Marcos Baghdatis, had his first training yesterday at the Locomotive Plovdiv tennis courts. The 25th in the world rank list is currently in Plovdiv for the forthcoming tennis games of the Davis Cup, between the teams of Bulgaria and Cyprus. Baghdatis is accompanied by his brother Petros, Photos Kalias (505th in the world) and Christopher Koutroutsas. The guests are staying at the Plovdiv Novotel Hotel, where the BG tennis players Todor Enev, Ilia Koushev, Yordan Kunev and Ivaylo Traykov are also staying. The organizers had a dinner for the two teams last night at the Puldin restaurant in the Old Town of Plovdiv.